From January 13 through to March 25, 2018 Season of the Force returns to Disneyland Paris. Guests will have the opportunity to experience shows, attractions and meet-n-greets from a Galaxy Far Far Away. While the entire resort will take part in Season of the Force, Walt Disney Studios Park is the place to be throughout the season. 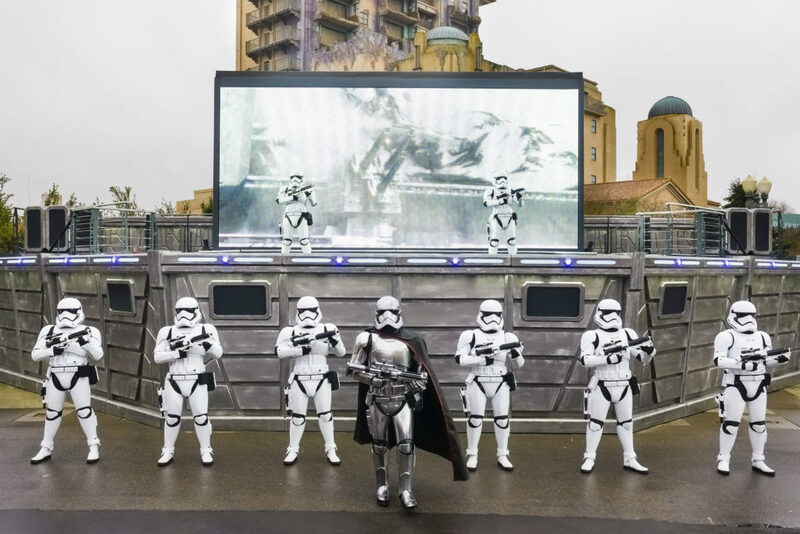 Last year Season of the Force was hosted for the first time at Disneyland Paris. Read our Season of the Force 2017 review. During Season of the Force, guests have plenty to experience and do. Read below what you can experience in each park. The main park for Season of the Force, Walt Disney Studios Park. Throughout the day, there are several shows on the Production Courtyard. As times might change, it is best to keep an eye on the daily program which you can grab at the turnstiles, access through the mobile app or review on the website. Back from last year, this nighttime spectacular which takes place at park closing, will use the Hollywood Tower Hotel as a backdrop. 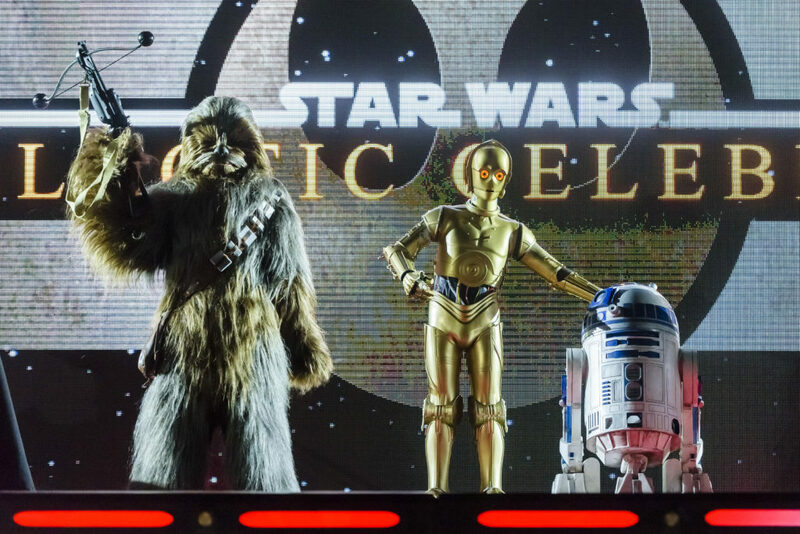 The stage will feature some of your favourite Star Wars Characters. The projections also feature scenes from the new Star Wars movie; The Last Jedi. During the day you have the opportunity to experience your favourite Star Wars characters on stage at the Production Courtyard. As times can differ day by day, it is recommended to check the schedule. Star Wars : A Galaxy Far, Far Away uses some of the same screen projections of Star Wars : A Galactic Celebration but the fact that several Star Wars characters appear on stage, makes it a show you don’t want to miss. This show mainly takes place on the screen and the stage in front of the stage. So while you can see it from anywhere on the Production Courtyard, you might want to move as close as possible to the stage. The First Order March takes place before this show, it is recommended already finding a good spot so you can enjoy both shows after one another. Several times a day, a First Order March lead by Phasma takes a hold of the Production Courtyard. The march takes place in front of the screen and the stage. Pay attention to the ropes put up by Cast Members. When Phasma orders her troops over the Courtyard, you really get the feeling like the First Order has taken over Disneyland Paris. When you not expect it, Stormtroopers will patrol the Production Courtyard. Before you know it, you are seen as a member of the resistance and arrested. While the Stormtroopers patrol the Courtyard, you will have time to snap a quick photo with them. Also here, it is recommended you check the schedule to see when the Stormtroopers are out. Apparently something new is happening this year. What, that is still a secret. But what we gather from photos on the Disneyland Paris website, TIE fighters might be making their way to Walt Disney Studios Park. Over at Les Légendes d’Hollywood inside Studio 1 you will find plenty of Star Wars themed merchandise. While Walt Disney Studios Park is the main park, Disneyland Paris is also host to several Star Wars related experiences. Just like at WDS, also here keep an eye on the daily program which you can grab at the turnstiles, access through the mobile app or review on the website. 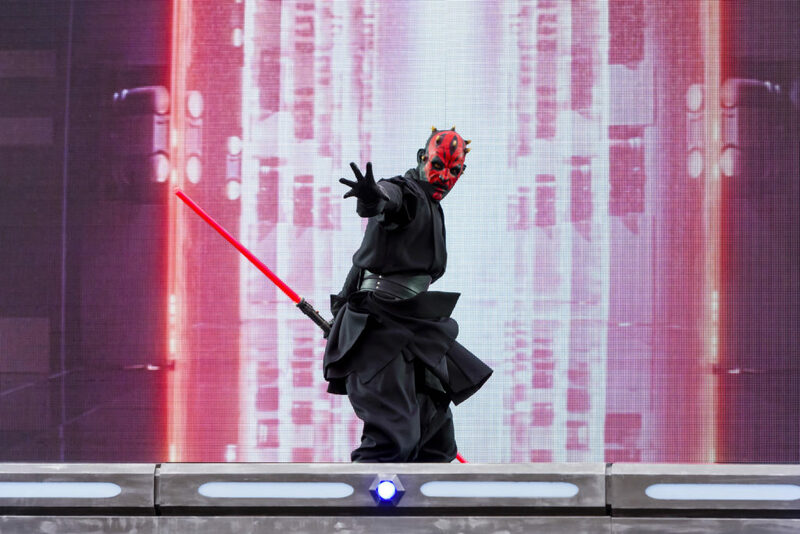 Meet your favourite Star Wars Characters at Disneyland Park. You can meet Darth Vader art Starport in Discoveryland. 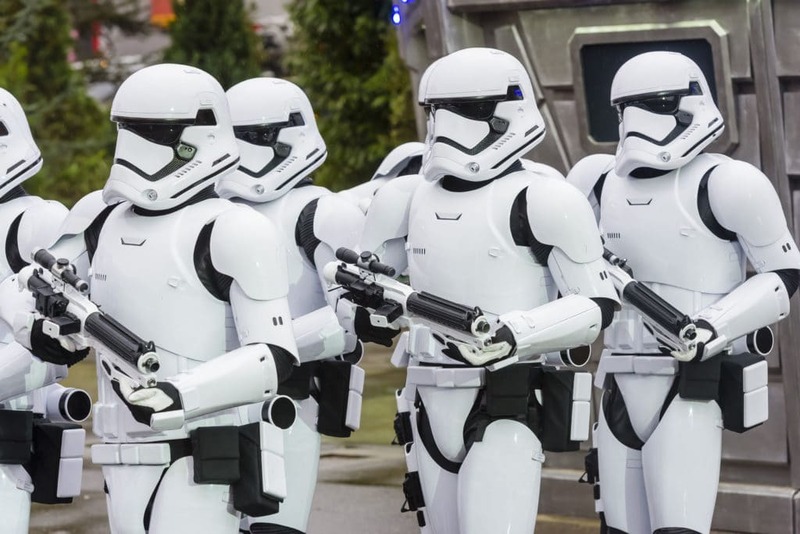 And from March 31 2018 Stormtroopers will patrol Discoveryland. Experience Star Wars in 3D over at Star Tours. With the new mission, you can already experience Batuu. Star Tours offers Fastpasses which makes it easier to plan your day. Blast through space on Hyperspace Mountain. This amazing indoor roller coaster will fly you with hyperdrive through outspace while you experience a battle between the First Order and the resistance. Hyperspace Mountain offers Fastpasses which makes it easier to plan your day. At the end of the day when Disneyland Park closes you can experience several Star Wars scenes during the Nighttime Spectacular Disney Illuminations. The Star Wars scenes start at the 12 minute mark. 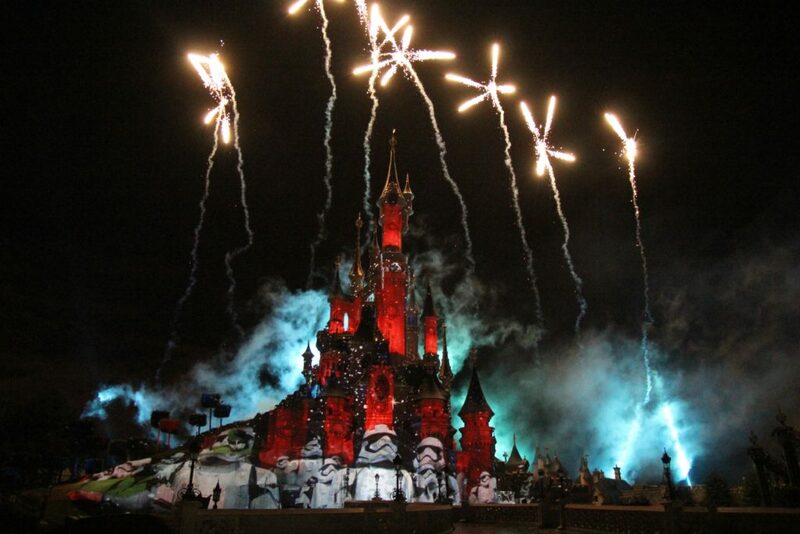 Disney Illuminations is the new firework show for the 25th Anniversary of Disneyland Paris. Over at Star Traders you will find all the Star Wars themed merchandise you ever wanted.